Now these aren’t new flavors, but they are being sold in a new small size. The tin is about 3″ by 2″ which means it can fit nicely in your pocket or purse. The mints themselves are smaller too â€“ about the size of a corn kernel as opposed to the normal lima bean size. (Yeah, as if you Candy Addicts ever eat lima beans.) 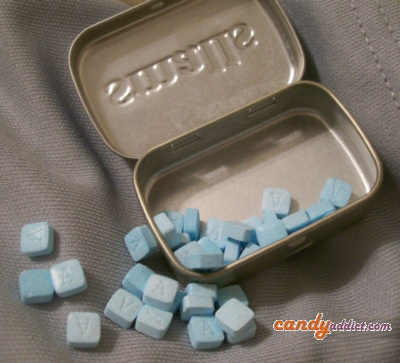 These Altoids Smalls are sugar free, unlike their larger cousins. They’re sweetened with sorbitol and sucralose, and according to Wikipedia they contain a pork gelatin. You vegetarians will just have to resist. Why I ended the last two paragraphs with a sentence in parentheses, I do not know. Unusual prose aside, the new Altoids Smalls Sugar Free Mints are a delightful bit of tasty freshness that will slip into your pocket. my favorites are the spearmint. if you like spearmint, i totally recommend these. you can’t eat just one. i’m addicted. i also like the hot stuff-those cinnamon ones really are good. Thanks, Amy. I do like spearmint so I’ll have to try them. I’ve been thoroughly enjoying the wintergreen which my son rudely polished off while I was gone this evening. I’ll pick up a pack of the spearmint next. It looks like the Altoids Smalls tins changed, because the tin I have in front of me is one of those tins where the lid slides open, not the hinged ones. Does anyone know when they changed the tins? Apparently they also changed the amount of mints in each tin. The old tins have 60 mints each, and according to the pics, the new tins have 50 mints each. These do look good, but I am a bit saddened by the change of the tin! I loved those little slide-open tins and recently lost the last one I had. They were perfect for little stuff, like earrings etc., and easy to toss in your purse. Looks like I need to take a trip around town and see if I can find someplace selling the old tins still! I have tried the three varieties and the peppermint is my favorite by far. At first, one mint at a time would satisfy but after a few weeks you will find yourself popping two or three at a time and chewing. It looks like the manufacturer may have intentionally fashioned the mints to look like drugs. I know those pictured above remind me of some pills I used to take back in my drug stage of 2005. Lol. Anyway, I highly recommended this product. My habit is currently around 3 tins per day. At least I don’t smoke and I am drug free. I really don’t like these mints. I tried some and they tasted more like artificial sweetener than mint. Too bad they don’t make smaller tins of the normal altoids. I just tried one of the wintergreen Altoids, and the flavor is HORRIFIC! The store didn’t have any of my favorite sugar-free peppermint Altoids, but they had these, so I figured I give them a try… The one I tasted and had to spit out halfway through tasted like super-strength Pepto Bismol. Based on your review, I think I’ll try cinnamon Altoids if I can’t find peppermint next time.